The 3e Factor approach to developing the High Performance Organisation is focussed on "Transforming Strategic Thinking into Reality by Developing Corporate Capability". Through Engaging, Energising and Empowering people across the entire organisation, The 3e Factor ensures that Business Transformation becomes deeply embedded and sustainable. The flagship of the The 3e Factor approach is our High Performance Cube capability development methodology. The High Performance Cube is a holistic capability development methodology designed by The 3e Factor to assist business transformation. This powerful, multi-faceted approach focuses on Engaging, Energising and Empowering - Individuals, Operating Groups and the Organisation - through a program of Assessing Awareness, Developing Skills and Applying Capability. Note: The 3e Factor gives permission to print the High Performance Cube, providing the source is acknowledged wherever the diagram is used or referred to. The 3e Factor High Performance Cube capability development methodology takes the individual on a journey of awareness moving progressively from conscious self to unconscious other and introducing complementary capabilities of leadership and strategic thinking. For a summary of the High Performance Cube capability development methodology, see the Program Outline (pdf, 43kb). Positive and productive cultures start with the individual. This phase commences with identifying the individuals level of engagement and areas holding back high engagement and participation. A collective of individuals, teams, are the powerhouse of the modern corporations project effectiveness. This phase focuses on areas that energise the group making them more productive and innovative. Innovation may simply be about improvements in business processes or a major business transformation. Strong purpose and high integrity in business culture are critical to high performance organisations. This phase focuses on the alignment of organisation culture with purpose and identifying areas for refinement, and the relevance of communication channels. Based on an assessment of an individual's emotional intelligence and strengths (talents), this process seeks to understand where an individual is at. Research by Dan Goleman confirms the importance of emotional intelligence in dealing with and influencing people, while Gallup research highlights the importance of people working to their strengths. Using the assessments from Phase One, individual skills are developed through coaching (one-to-one and face-to-face) and experiential workshops. Coaching covers communication tools, development of leadership, emotional intelligence, influencing strategies and tactics, ways to apply their strengths, time management, effective focus and disciplined behaviours. Workshops cover primary and advanced leadership, communication strategies and tools, change management, stakeholder management, team dynamics, networking and collaboration. To enable the application of newly learnt concepts, strategies and tools, participants use a series of practical in play organisation projects. The integrity of the corporate process is overseen using mentoring. The practical nature of these projects ensures that outcomes to the business are immediate. 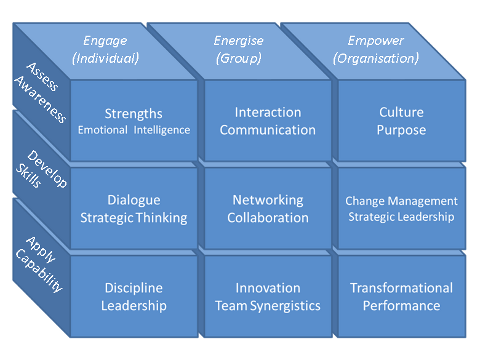 Phase Three - Empower (pdf, 45kb) is based on active outcomes achieved through reintroducing participants to the purpose and preferred culture of the organisation and aligning the application of program learning through facilitation of relevant scenario planning and practical projects both at the levels of individual and team leadership. For more information on our High Performance Cube capability development program or other services, please contact us.